I admit that my knowledge of prison economics rests squarely on Shawshank Redemption marathons on TNT, but even I know that cigarettes are used as currency in the clink (people still call it "the clink," right?). But just as inflation has driven up the dollar on the outside, the prison economy has shifted considerably in recent years: tobacco has taken a backseat to the almighty ramen. 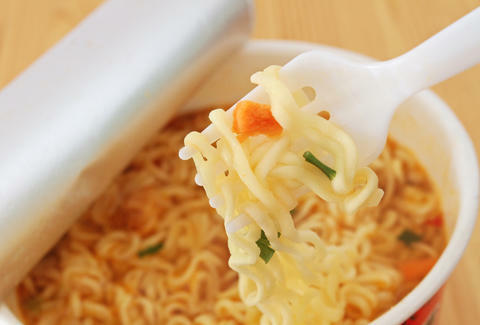 The researcher behind the claim, University of Arizona’s school of sociology doctoral candidate Michael Gibson-Light, asserts that the rising demand in ramen correlates with the decline in the quantity and quality of prison food. For reference, five cigs or one sweatshirt can be bought for one pack of ramen, which is worth roughly $5 in prison terms. Inmates will also use packs of ramen to buy fresh veggies stolen from prison kitchens. But this research isn't entirely breaking new ground, as the phenomenon already has its own decidedly passionate subculture. Ex-con Gustavo “Goose” Alvarez's 2015 book Prison Ramen is entirely dedicated to ramen behind bars, featuring former and current prisoners' anecdotes and recipes -- like "Ramen Goulash," and "Ramen Nuggets" -- as well as entries from celebrities like Slash and Shia LaBeouf (who are pretty much always on the verge of being arrested, themselves). Overall, it's a bleak reality for sure. Prisoners are so underfed that ramen noodles, the lowest, most wan option on the college food pyramid, are more highly valued than cigarettes, which are literally addictive. Wil Fulton is a staff writer for Thrillist. He's never been incarcerated, but he has been arrested. Follow him @wilfulton.